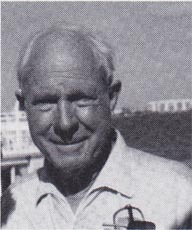 Wallace A. Utley, Commander, born July 26, 1916, Oak Park, IL, and joined the USN in June 1936. He was stationed aboard the USS West Virginia, August 1940-November 1941; USS Massachusetts, April 1942-May 1944; and USNA Post Graduate School, October 1944-June 1947. He was discharged in June 1940 and retired from active duty in June 1960. Married Helyn and has four children: Wallace R., Bunny J., David F. and Linda S. An associate professor of physics, teaching and is presently living with Helyn at Fleet Landing Retirement Community at Atlantic Beach, FL.